Super foods – those seeds, herbs, vegetables and fruits that are higher in nutrients per calorie than other foods – are rising in popularity (and price). However, if you’ve got the inclination, growing your own super foods is a healthier and more economical option. Why it’s healthy: Kale is full of antioxidants that protect cells from free radicals that can lead to cancer and other diseases. Kale also lowers cholesterol and contains tons of vitamin K to protects bones. Planting it: The seeds can be sown or germinated six weeks before frost arrives, which doesn’t so much apply here in San Diego. Kale germinates quickly and requires very little maintenance because it’s so hardy. Seeds and plants can be grown all year round and can tolerate a wide range of temperatures but will taste more bitter when grown in temperatures over 80F degrees. If you don’t have the space to grow kale in the garden, you can grow it in a pot or other container, however, the container must have at least six square inches of space for the plant to grow. Move kale grown in containers into a partially shaded area in the summer. How to eat it: In smoothies, salads, and all manner of delicious recipes, like sausage kale soup. Why they’re healthy: According to nutritionists at the Center for Science in the Public Interest (CSPI), the sweet potato is the most nutritious vegetable of all – of all! Sweet potatoes contain lutein and carotenoids that go to work on excess free radicals in the body. Planting them: Many gardeners buy “slips” (young plants) from garden centers or online. Slips need to be planted quickly in warm weather and in soil that’s up to three inches deep and in rows about three feet apart (sweet potato plants spawn sprawling vines). 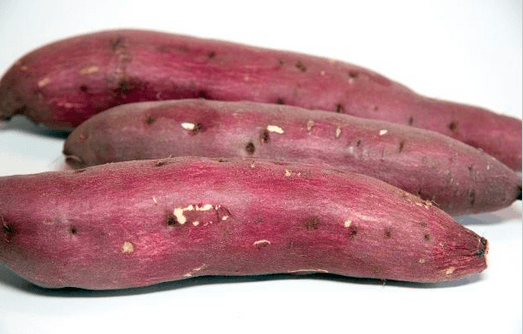 Sweet potatoes need about four months to grow into full-size tubers. How to eat them: Baked, au gratin, french fried, mashed, and roasted. Here’s an excellent recipe for oven-fried sweet potatoes. Why they’re healthy: Flush with antioxidants and flavonoids, blueberries are said to lower the risk of heart disease and cancer, keep you sharp as you grow old, and act as an anti-inflammatory. 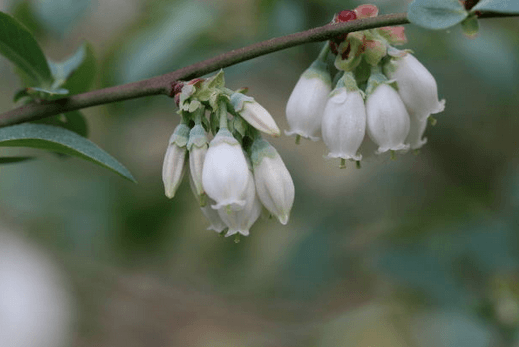 Planting them: The best blueberries to grow in the Southern California region are reportedly O’Neal, Misty, Emerald, and Jewel. Container planting is popular for blueberries because the soil’s PH level can be monitored more closely (blueberries prefer acidic soil). Make sure your blueberries are in full sun if you live near the coast or partial shade if you live in the hotter inland areas. Keep the plants well watered – moist but not soaked – and fertilized during growing season. How to eat them: Plain, in Greek yogurt, on cereal or oatmeal, over ice cream, in a cobbler, and most definitely, in a pie. Why they’re healthy: Brussels sprouts contain high levels of sulforaphane, a chemical believed to contain anti-cancer properties, and are a good source of vitamin C.
Planting them: Brussels sprouts should be direct seeded in the warmer climate of San Diego. 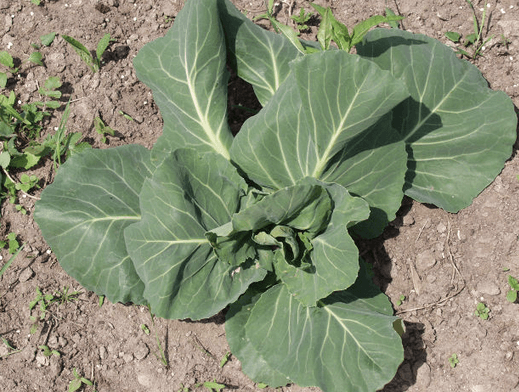 They take about 90 days to produce sprouts, so they are planted in early summer for a fall crop or in early spring before they face the heat of summer (brussels sprouts do best in cooler weather). Brussels sprouts need to be about 18 to 24 inches apart in a row or bed because they can get large. Although excessive heat isn’t favorable, brussels sprouts need a minimum of six hours of sunlight a day and they like well-drained, moist soil packed with organic matter. How to eat them: Roasted with balsamic vinegar over top, steamed with butter, with rigatoni and cauliflower. Why it’s healthy: Purslane contains more cholesterol-lowering omega 3 fatty acids than any other leafy vegetable. How’s that for a weed? It also has some of the highest levels of Vitamin A and Vitamin C.
Planting it: Most of the time you can locate purslane growing wild in your garden, yard or nearby yards and parks. Cut off the leaves at the tips, and the plant will sprout where you put them. Nutrients are in the leaves so avoid the stems. How to eat it: Raw and in salads. 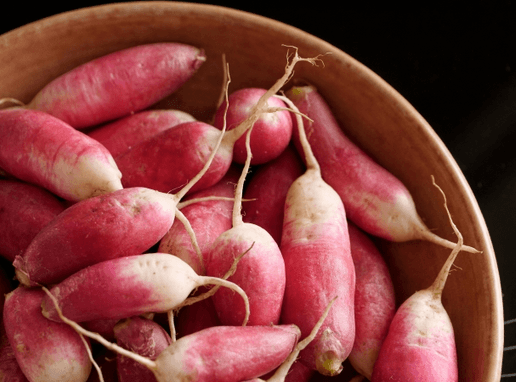 Why they’re healthy: Radishes are high in Vitamin C and packed with antioxidants. Radishes are also among the most alkaline vegetables. An alkaline diet is said to promote health. Planting them: Radishes are sown directly in your garden and are ready to eat in less than 30 days. Because radishes are cooler-weather vegetables, they can be planted in the fall. Radishes require sun and well-drained soil that is kept moist. Pull your crop as soon as the roots mature because radishes left too long often crack and are tough. How to eat them: Sliced raw, grilled, juiced, sautéed, as greens and as sprouts. 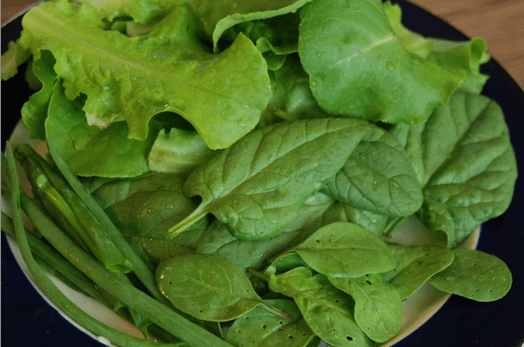 Why it’s healthy: Arugula boasts exceptional levels of vitamins A, B C and K. It’s also brimming over with copper, iron, phytonutrients, chlorophyll and fiber. Planting it: Either get a small arugula plant or start from seed. Sow the seeds in a sunny location in succession plantings (approximately every 20 to 30 days) from early spring to fall. Arugula grows from seed in less than 45 days, so it’s considered a fast crop. Containers are also often used to grow arugula. Use organic potting soil and keep the soil moist but not soaked. Be sure to cut the leaves off as the plants mature. How to eat it: In salads, pizzas, sauces, and soups. Why they’re healthy: Goji berries contain betacarotene, vitamins B1 and B2, and minerals and amino acids. Goji berries have the highest antioxidant level of any food. Planting them: The Goji berry plant is fast growing and does well in all climates and soil types, although the latter requires good drainage. Goji berries are harvested from August to November. If you’re growing Goji berry plants in the ground, make sure they are in a sunny location, and have room to expand. Mature Goji plants can grow up to 8-feet high and wide. That said, Goji berry plants can also be grown in containers on your deck or patio. Goji roots grow deep, but because the plant will stop growing once the roots make contact with the bottom of the container, they won’t grow as large as they do planted in the ground. How to eat them: Harvested berries can be dried, eaten raw or brewed into a tea. 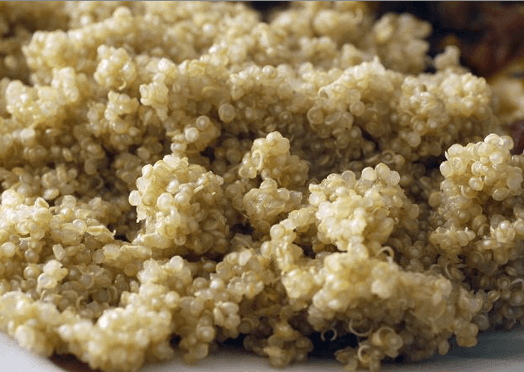 Why it’s healthy: Quinoa is high in protein, fiber and iron. It also contains impressive levels of zinc, vitamin E, and selenium. Planting it: Sow seeds directly in the garden – or scatter them on top of the soil. Quinoa produces a taller crop, so it needs plenty of room. Quinoa plants prefer cooler temperatures (think coastal areas), full sun, occasional watering, and well-drained fertile soil. Because the plants grow so tall and wide, quinoa is not typically not suitable for container growing. How to eat it: Like you would rice, and also in soups, salads, or stuffed in tortillas or red peppers. Why they’re healthy: Sunchokes are high in essential minerals potassium, magnesium, and iron, all of which assist in the healthy functioning of the heart. They also contain inulin, which is a starch undigestible by humans, but considered good for intestinal health. Planting them: To grow sunchokes, you simply need to find some tubers in a gardening catalog and plant them in the ground. Sunchokes grow best in well-drained soil and in full sun. Plant small seed tubers 4 to 5 inches deep and 16 inches apart. Do note that sunchokes are rumored to thrive – so well in fact that they’ve been found to overtake gardens if you’re not careful. How to eat them: You can roast, sauté, bake, boil or steam sunchokes. You can also eat them raw in salads. Diabetics sometimes turn to sunchokes as a potato substitute. Growing your favorite super food – or trying some new ones – is surprisingly easy to do. As always, research each plant before growing it to make sure it’s right for your garden and space, as well is a fit for your microclimate and taste.